I’ve never really gotten Thanksgiving. I attribute this in part to my status as a first generation American. And to the fact that I hate turkey. Oddly, I think many people do. I also don’t particularly care for (American) football or parades, although with a bit of adventurous re-tooling of the latter I could probably be convinced. Gladiator-style balloon battles might be catchy or perhaps sharpshooters positioned to take out the inflatables as they progressed down 5th Avenue (last one floating gets some sort of prize). No doubt I am digging for Quetzalcoatl analogies: the rituals that would accompany celebration in this new land. But no, the latex membrane of Big Bird shall not be laid down in sacrifice. 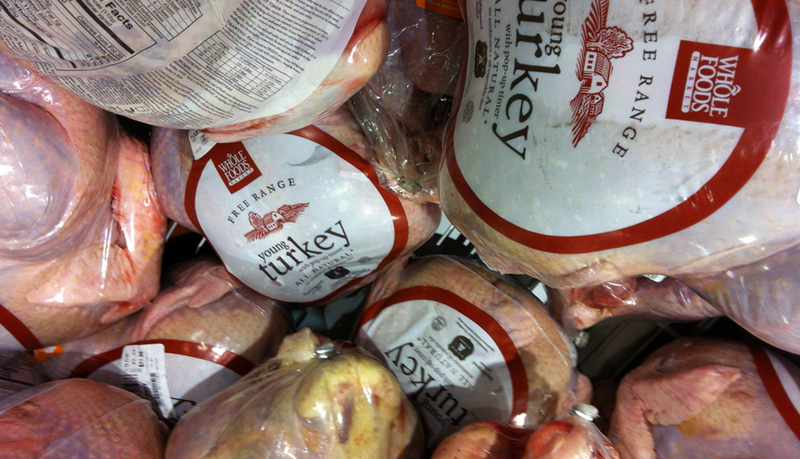 Benjamin Franklin wanted the turkey declared our national bird. I can’t help, in considering the annual feast at which the turkey is consumed, but equate the act with the ingestion of the Host *: the national bird devoured by the people of the land as the trees lose their leaves and the skies darken. At Thanksgiving America eats itself in an act of nationalistic self-consumption. Surely this is a rejuvinative act. Or is it one of penance? How can the national dish be prepared with such cavalier indifference?? Is this what constitutes celebration and the rationale for massive annual carbon footprint deposition? Where are the figs, the minstrels from those Bruegels’s feasts, the truffled oils, or the puddings cooked months in advance? I made a turkey once. Last year W. and I bought a “bird”, brined it in a large pot like a mutant pickle and then cooked it. As everybody says, its all about the sides. Or the goose. I think its time for an upgrade. Why couldn’t the good citizens of Plimmoth have eaten a salmon that first chilled November day?? * complete with surrogate idols: (tofurkey????). Also that’s “Host” as in communion, not as in the kindly person who invited you over for a meal. I do no wish to imply that Americans are cannibals. ** Spoken by the care-free intelligent man at the table next to mine at lunch; he was probably an MIT professor.